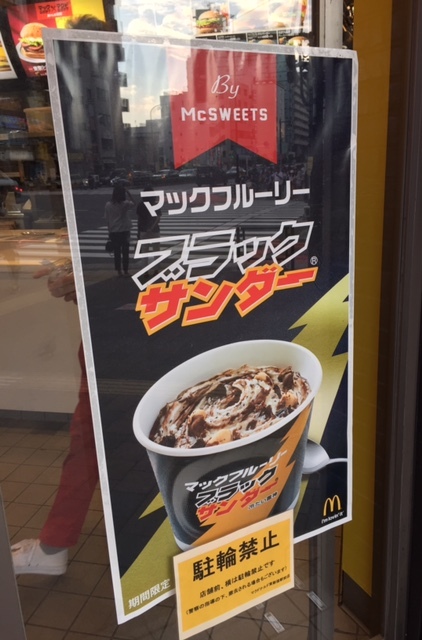 McDonald's Japan launched a new limited item, McFlurry Black Thunder on August 16, 2017. Black Thunder is a famous cheap chocolate snack manufactured by Yuraku. The McDonald's that is close to our hotel had advertisement and they're still selling the product luckily. Sadly, the special McFlurry Black Thunder cup was out of stock. 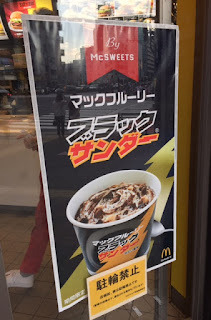 They mix soft serve with cocoa cookies, plain biscuit and chocolate sauce that are used in Black Thunder. The soft serve was rich and smooth as always, and slightly bitter cocoa cookies and fragrant plain biscuits were crispy and adding some crunchiness to the velvety soft serve. Chocolate sauce was mixed in and didn't do much since the cocoa cookies had the strongest flavor. It really was an soft serve version of Black Thunder and it's really good.